Getting to the roots of the country’s culinary tradition! The Russian stove, preservation techniques and the Orthodox faith all played an important role in developing Russian cuisine. Russia's unique cuisine and culinary culture developed over time, as the early inhabitants of Rus’ adjusted to the region’s difficult climate and developed their own traditions. The Russian stove, preservation techniques and Russian Orthodoxy all made important contributions to the development of Russian cooking. The long, cold winters gave rise to the stove, while the use of pickling and drying allowed early Russians to preserve food for the months when nothing would grow. Later, Orthodox practices organized Russian culinary habits around the feasts and fasts of the church year. Here is a closer look at the role these three elements played in the foods Russia has become known for. The unique taste of traditional Russian dishes comes from the Russian stove. The construction of the stove has remained the same throughout the centuries. A Russian stove is shaped like a tunnel and resembles a furnace. This construction allows the temperature inside to rise to 200 degrees Celsius (about 400 degrees Farenheit). Russian stoves are very efficient. Even after the fire burns out, the heat remains. Russian stoves could be used for a wide variety of cooking techniques, including roasting, boiling, stewing, simmering and baking. 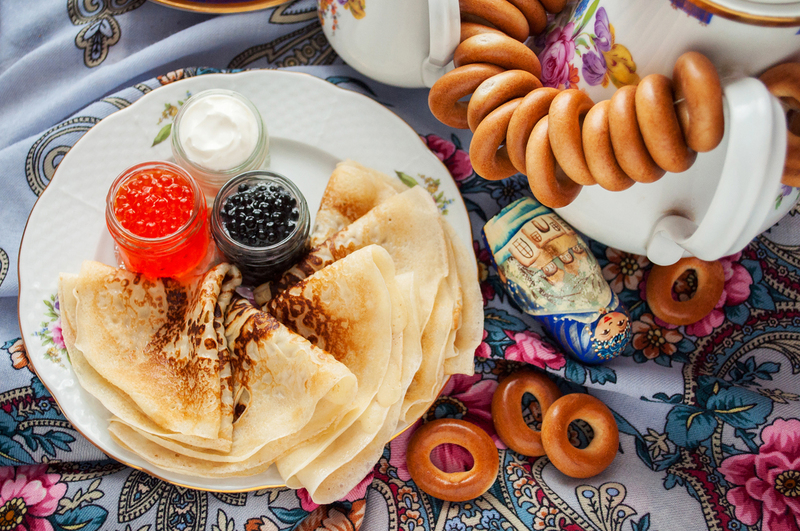 Some of Russia’s most famous dishes — Russian rye bread, buckwheat porridge, roast with mushrooms and potatoes in individual pots and baked milk — came out of the stove. Early Russians were engaged in farming, hunting and fishing. Milk, grains, mushrooms, berries, nuts, honey, cattle, game, fish made up the Russian diet, but these needed to be preserved, considering that snow covered the ground for much of the year. Over time, Russians developed effective ways to store up food for the winter. Among the techniques developed were drying and pickling. Russians dried food both outdoors in the sun and in the stove. They also learned that nearly every vegetable and some fruits could be pickled or soured. Other fruits could be preserved by sugaring them with honey. All these traditions helped Russians survive - both by making sure there was food to eat, but also because these techniques maintained many of the nutritional benefits of the foodstuffs. According to tradition, Prince Vladimir of Kievan Rus’ has his people baptised into the Orthodox faith in 988 and practicing the tenets of this religion became an important part of the life of early Russians. Orthodox believers observe a number of fasts throughout the year. During the fasts, believers are forbidden from eating meat, dairy products and eggs. These prohibitions gave rise to dishes based on lentils, peas and beans, primarily soups and berry-based drinks called kissels. Kissels could be made from oats, fruits and berries with leaven made from rye flour, barley or wheat. People also consumed mushrooms, forest berries, nuts covered with sugar or honey and sour vegetables, which provided them with vitamins and antioxidants. The ancient Russian proverb “Khren da red’ka, luk da kapusta - likhogo ne popustyat” (“horseradish and radish, onion and cabbage will keep evil at bay) has been verified by contemporary research, which shows the anti-inflammatory, antiviral and antimicrobial properties of these plants. ANother Russian dish with health benefits is sauerkaut, which preserves 80 percent of the Vitamin C contained in its base vegetable, cabbage. Cabbage also contains a large amount of Vitamin U, considered to be effective in preventing ulcers. At the end of the fast, these pulses and sour foods were combined with meat, fowl and fish to create some of Russia’s best-known dishes. Shchi with pork and sauerkraut, borscht with beef, the fish soup ukha and goose with sour apples were all celebrated as evidence of God’s bounty.